This Australian war comic presents Lieutenant "Hurricane" Jackson of the Royal Australian Navy as a hero who leads a rescue attempt of Allied POWs held at an unnamed kamikaze base in Kyushu. He receives help from two members of the Royal Air Force held as prisoners after being shot down during a reconnaissance flight. The comic has an exciting plot but little historical accuracy. Jackson, seconded to a U.S. task force fighting on Okinawa, tries to escape a Japanese counterattack by getting to an American landing craft not yet hit. The landing craft barely reaches a tanker, which gets torpedoed by a Japanese sub. The sub captures Jackson floating in the water and returns to Kyushu, where Jackson gets thrown into a POW cell. He and two other cellmates, Barlow and Miles from the Royal Air Force, escape when American bombers attack the area. The three men search for and find a nearby kamikaze base, where an Allied airborne detachment that had parachuted into the area causes damage. Colonel Ugaki, commander of the kamikaze operations, threatens to shoot 20 POWs as retaliation against the enemy sabotage operations. He orders the Allied prisoners to march in front of Japanese troops in the event of an enemy landing. Jackson signals by a blinking light to a submarine off the coast to not attack due to the beaches being heavily mined, but he sends this false signal only to protect the POWs. The Allies figure out that the mines had actually been cleared and that the light signal was a fake. Jackson, Barlow, and Miles create a diversion to try to free the POWs. As the POWs flee, American bombers attack the base while Betty bombers each loaded with a kamikaze ohka (rocket-powered glider bomb) begin to take off. One Betty bomber gets hit by enemy fire, and the ohka plunges down and crashes on the airfield. Jackson gets rescued but cannot remember anything due to shock caused by the ohka explosion. He returns to a Sydney hospital to recover, but he is court-martialed for sending the fake signal to the submarine off the coast of Kyushu. Miles arrives in Sydney just in time to give his testimony that Jackson sent the false signal in order to save the POWs. 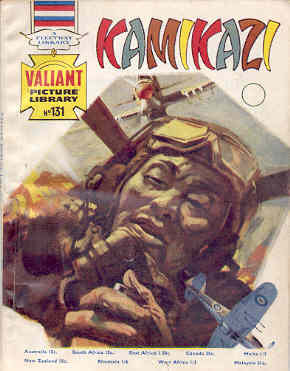 The comic book Kamikazi (spelled differently than the correct Japanese of Kamikaze) has plenty of exciting action but with quite a few discrepancies with actual history. The comic's kamikaze base has Allied POWs, who were used to build the air base. In real history, the military did not keep POWs at air bases on the home islands or use them in the construction of airfields. The story depicts an Allied landing on Kyushu that never actually occurred. The comic mentions jungles several times on the southernmost Japanese main island of Kyushu, even though the island does not have jungles. Ugaki, a colonel in the comic but a Navy vice admiral in history, gets portrayed as a sadistic madman who will take revenge by shooting Allied prisoners in cold blood. He did lead Japan's kamikaze operations from February 1945 until the end of the war, but his diary portrays him less as a madman and more as a military strategist trying to use all means possible to win the war. He mentions no direct encounters with Allied prisoners during the war. The comic shows ohka missiles released from Betty bombers whenever referring to kamikaze aircraft, but actually the Japanese Navy and Army employed many different types of aircraft in kamikaze attacks. Slow-moving Betty bombers loaded with ohka glider bombs would never have been allowed to take off in the middle of an enemy air attack on a base. The comic's first page shows an ohka glider bomb about to crash into an aircraft carrier, even though this never came close to happening in actual history as most Betty bombers got shot down by American fighters before they could release their ohka weapons. Kamikazi misrepresents the historical background and stereotypes Japanese military members, including kamikaze pilots, as fanatical and heartless. However, this long comic story of 58 pages has a plot filled with action and suspense.